Truth is often stranger than fiction, and the story of the West Malling Elizabethan Jug (‘The Malling Jug’) deserves a permanent record in the annals of the parish. There stood in the drawing-room or study of the Vicarage unobserved, unobtrusive, and save to a few learned antiquaries, unknown, a small stone-ware Jug, with silver-gilt mountings and body-straps, each piece of silver hallmarked with the Roman letter D, set in an indented shield. This marks the year 1581, so that the antiquity of the vessel was well known. Scarcely anybody ever came to look at it, not one parishioner in a hundred had ever seen it, or knew of its existence; and yet, though so little appreciated, it was a thing of rare beauty. 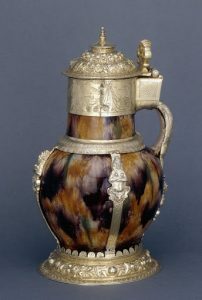 The shape, the colouring, the elaborate silver repoussé work, at once captivated the eye of the connoisseur; and even those whose untrained facilities fit not at first appreciate its beauty, learnt to admire it as soon as their taste was sufficiently educated to perceive its artistic merits. But besides being beautiful, the Jug was in excellent preservation; moreover, it was rare and almost unique. How it came into the possession of the parish is not known. The present Vicar, soon after his institution in 1894, received it from the retiring Vicar, the Rev. J. H. Timins, who also kept it at his house. A legend arose that the vessel was discovered by the late clerk, Mr. Evans, in a cupboard under the old pulpit, when the Church was re-floored and re-seated in 1862. But there is absolutely no evidence that the Jug, said to have been found was the famous Jug in question. On the other hand then, the late Rev. J. H. Timins is stated, on excellent authority, to have said that the Jug was handed to him when he became Vicar in 1842, by the executors of his predecessor, the Rev G. F. Bates. From this would appear that it was the property of the Church, handed down from generation to generation. There is, however, absolutely no evidence, documentary or otherwise, to show for what purposes the Jug was used. It may have been used as a flagon for the Holy Communion or for secular purposes. The Church plate prior to 1787 has vanished. It is true that Church authorities were not very particular as to what they used for sacred vessels. In some Parish Churches the chalices now in use were once the whistling-cups of the wine feast; and it is possible that the Malling Jug in question may have formed part of the Church plate, although it was not originally made for Church uses. This is perfectly obvious from the design, which is pagan and not Christian. The Jug was obviously made for quaffing of beer or sack, or other wine. But we must proceed with our romance. One day, about July, in the year 1902, a gentleman resident in Kent, who has a fine collection of articles of vertue, offered the Vicar and Churchwardens £200 for the Elizabethan treasure. They, however, agreed that if a private collector was willing to give so large a sum, the article was worth more in the open market. They therefore determined to sell it as Messrs Christie, Manson and Woods, the far-famed auctioneers of 9, King Street, St James’, London. The next step was to call a Vestry, with a view to obtaining a faculty for permission to sell, both in order to protect themselves and to give the purchaser legal security of tenure. A certain amount of publicity is inevitable in the procedure of applying for a faculty; hence the intended sale became public, and was noticed in the newspapers. Other offers of £300 and £350 were made, and finally the original would-be purchaser was willing to give £500. But the Church authorities resisted the tempting offer. On December 13th, a consistory court was held in the Girls’ Schoolroom. The presiding Judge was Dr Tristram, K.C., Commisary-General of Diocese of Canterbury. The petitioners were presented by Mr W. N. Lawson, M.A., Barrister, late of 6, Stone Bildings, Lincoln’s Inn, who was instructed by Mr. James Brennan, Solicitor, of the firm of Messrs Brennan & Brennan, of Maidstone and West Malling. The faculty was opposed by a leading antiquarian. Evidence was taken on oath, and the Judge decreed a faculty to issue. The grounds of his judgement were that the Jug in question was clearly not designed for Holy Communion, and could not be used for that purpose; that it was not in use, and that where Church property was no longer of use he sometimes granted permission for its sale. Some antiquarians feared that an evil precedent would be set, and that the Clergy would be tempted to sell old and valuable Church plate. It was also urged by some that some relics of the past ought to be preserved in the Church and parish to which they belong. But as no Church property can legally be sold without a faculty, Chancellors can always prevent acts of vandalism, and would certainly refuse to allow Church plate in use to be sold. In this particular case there was no evidence that the Jug had been used for sacred purposes; and further, its value having become known, it would have been a white elephant in the parish if it was preserved there. It would have to be kept in a safe or in a bank, and no one could have the pleasure of seeing it except by infinite trouble; whereas now it will be carefully treasured, and seen by connoisseurs. The circumstances were exceptional, and the Church authorities were quite justified in their action; indeed, this was the view of the large majority of people. The faculty having been granted, the Jug was sent to Christie’s, considerable public interest was aroused, and the coming sale was boomed in the leading London newspapers. On the 19th of February, 1903, a large crowd assembled in the well-known sale room in King Street, and the excitement was intense. The auctioneer announced the West Malling Elizabethan Jug, without note or comment, for only experts and connoisseurs bid at Christie’s. He started the bidding at 300 guineas, and in three minutes the Jug was knocked down to Messrs. Crichton Brothers, of Bond Street, for the enormous sum of 1,450 guineas or £1,522 10s. 0d. In 2016, the price of 1,450 guineas would be roughly equivalent to £150,000 in today’s money! The actual sum received by the Vicar and Churchwardens was £1,408 6s. 6d. which they spent in completing their scheme of church restoration. A handsome and massive porch from the designs of Mr. Micklethwaite, was built by Messrs. Wallis, and a detailed bas-relief of the Jug in hard stone was placed in the East wall of the new porch. The oak block floor was put down in November, and the pews were ready by Christmas, and the choir and clergy stalls by Easter, 1904.